Set in a beautiful but dying Pennsylvania steel town, American Rust is a novel of the lost American dream and the desperation that arises from its loss. It is the story of two young men bound to the town by family, responsibility, inertia and the beauty around them who dream of a future beyond the factories, abandoned homes, and the polluted river. Isaac is the smartest kid in town, left behind to care for his sick father after his mother commits suicide and his sister Lee moves away. Now Isaac wants out too. Not even his best friend, Billy Poe, can stand in his way: broad-shouldered Billy, always ready for a fight, still living in his mother's trailer. Then, on the very day of Isaac's leaving, something happens that changes the friends' fates and tests the loyalties of their friendship and those of their lovers, families, and the town itself. 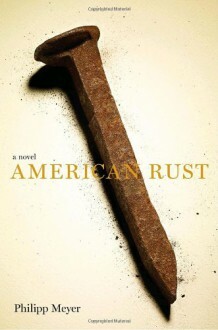 Evoking John Steinbeck's novels of restless lives during the Great Depression, American Rust is an extraordinarily moving novel about the bleak realities that battle our desire for transcendance, and the power of love and friendship to redeem us. I was struggling with rating this book - as it reminds me of John Steinbeck's work.The writing was confusing at first, but I learned to appreciate the way Meyer writes.3.5 stars rounded down.